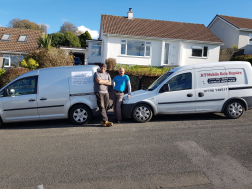 A.T Auto Repairs LTD has been running an onsite repair service since 2001 and covers a 70 mile radius from the centre of Cornwall. We work on all makes and models. Our local technicians for click mechanic are Andy and Mark. Mark carried out a pre-purchase inspection for us for a car that too far away for us to get to see. He noted one thing that needed further attention. 6 weeks later we found a massive hole in the exhaust, which was a surprising find given the inspection. Very pleased with the work carried out by Andy,would gladly recommend his services. The mechanic was great and helpful and only did the work needed even after I ordered more work. Great job, very professional. Arrived bang on time and was friendly and helpful. We previously have had some poor experiences with big name national franchises and various dealerships, but this experience was a pleasure. By far the cheapest quote, and I had phoned around a lot! Half the price of the dealership. Andy did great! I really appreciated his advice and he clearly know his stuff. Mark arrived on time and was polite and very professional. He carried out the service and left with no mess. Unfortunately the weather was awful but this didn’t affect mark. Very pleased! Did the job fast, offered good advice and was spot on time. Very happy with the work carried out. Andy was great and very helpful and friendly very pleased with his work. He explained the problem with great detail and found him to be honest and knew what he was doing and talking about.